I am using/modifying the ALSC blog's Water Science STEM program by Amy Koester. Station 1: Read about Water! This station will have a variety of books caretakers can read with their children. I have started highlighting on the station instructions printout the "featured book." The featured book for this STEAM is All The Water in the World by George Ella Lyon. Station 2: Sink or Float? We will have a big tub FILLED with water and have a variety of objects for kids to test the buoyancy. They will get to guess which objects will sink or float. 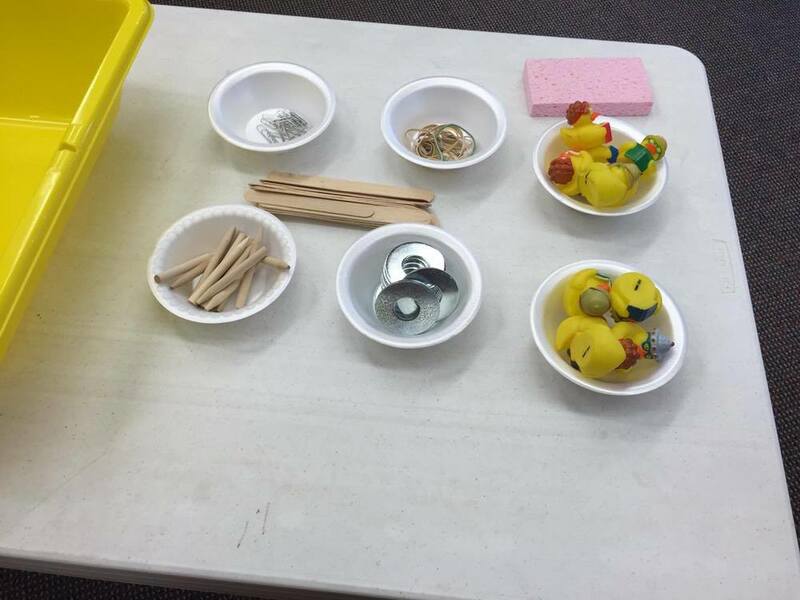 We have rubber ducks, Popsicle sticks, large metal washers, clothespins and paper clips. The objective is that wood and plastic float, whereas metal sinks. The giant tub that will be filled with water. Kids will test out if objects float or not! We will have a nice whiteboard with a chart for kids to mark if the different objects float or not. The kids will get to make a boat with modeling clay! We got cute bear counters and everything! The kids will get asked if they place the dough just in the water will it float or sink? After that, they will begin to make a shape of the boat. We even have small tubs of water for kids to watch their boat "sail." Station 3: Water Carnival: Hit a Target! We will be making our target range out of paper cups and let the kids have at it. I think it will be are best STEAM event, yet. Water Science was my least messy STEAM program. I'm pretty sure parents were EXTRA careful in making sure their toddlers/children did not get their clothes wet. The target range was a success, but I would remember to have a tape line where it tells kids to stand next time. The hardest station was the making a boat station. One kid opted to make submarines which was hilarious as she had the bears pilot them. I have some pictures from the setup displayed below.